TfL have put out a press release with everything you could possibly want to know about the bridge over Shoreditch High Street going up tomorrow, and the crane that's doing it. The crane is hooked up and ready to go, the road closure starts at 4am tomorrow and the actual move will happen between 8 and 10 am. The road stays closed until 5am on Monday morning. The diversionary route for cars appears to be going to Old Street roundabout and back. If you don't fancy venturing out, they're providing live webcam coverage. Any news on how this is going? The webcam appears to be Windows only so I can't see it. 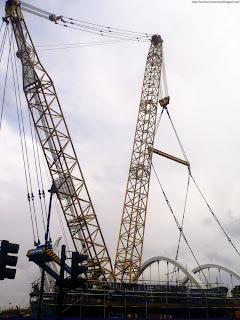 Bridge was moved into place by the time I got there at lunchtime, and they were securing it in place.